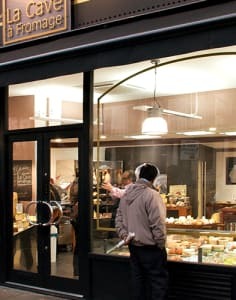 Started in their shop in South Kensington in 2007, Amnon Paldi and Eric Charriaux opened La Cave à Fromage out of wanting to share their passion for cheese following the success of Premier Cheese, our wholesale sister company. The cheese in our shops is also supplied to some of the best restaurants in the world, such as La Manoir aux Quat'Saison, The Waterside Inn, Cliveden and South Lodge Hotel amongst others. The team of cheese ambassadors are passionate about what they do, what they know and all they want to do is share this passion with you. There is a magnificent selection of farmhouse and artisan cheese from all over the UK and Europe that sit alongside cheese made and matured by La Cave themselves. It was all in all very nice experience, however I think that for such a luxurious cheese shop, the atmosphere could've been better. For example having blinds over the window as u often find people waiting for the bus staring at you whilst eating. Dimming the light may also help. Excellent cheese and great journey, but very dissapointed with the wine tasting. Proper large wine glasses were not used and by jumping from wine to wine, glasses were not changed nor rinsed. White rose and red in the same small glass which does not decanter as it is meant to. Lastly cosy atmosphere but way too close to the neighbouring tables, whilst sharing charcuterie was not ideal as some people are not respectful and weary that these are meant to be shared... Fun experience but not worth 40 pounds per person.